Crazy Aaron's Liquid Glass Putty | Nerd Much? If you’ve never heard of Crazy Aaron before, you might want to read up on the company a little. But, basically, the company is known in the toy world for creating truly awesome putty, such as Super Magnetic Strange Attractor Putty or Super Illusions Super Oil Slick Putty. 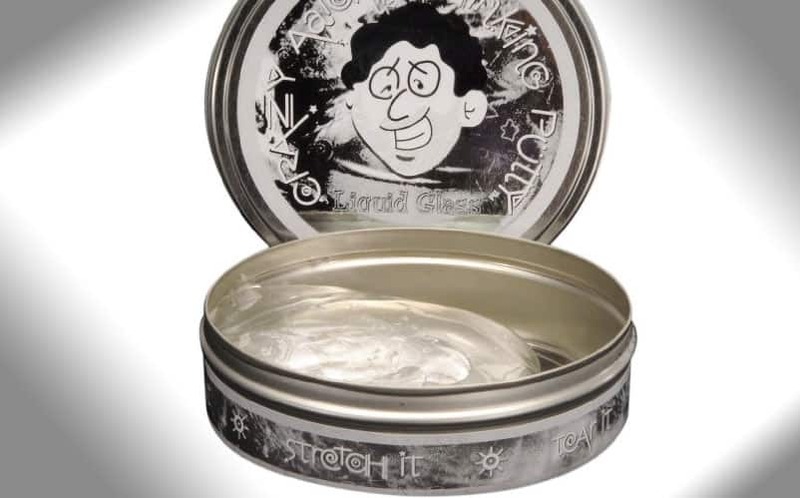 Now, they’ve added one more addition to their line-up of cool putty: Liquid Glass. The Crazy Aaron’s Liquid Glass Putty is one of the best desk toys we’ve seen, and it’s a perfect stress reliever. You can twist it, stretch it, snap it and sculpt it. It’ll turn cloudy while you play with it, but when you put it down and stop contorting it, it’ll go back to looking like clear glass. It’ll also give you something to mindlessly play with in your hands as you clear your mind, helping to improve concentration and boost thinking sessions. It’s available now for $11.